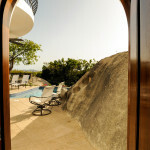 On the Rocks is a group of three architecturally designed round buildings, beautifully decorated in Caribbean colors and textures. 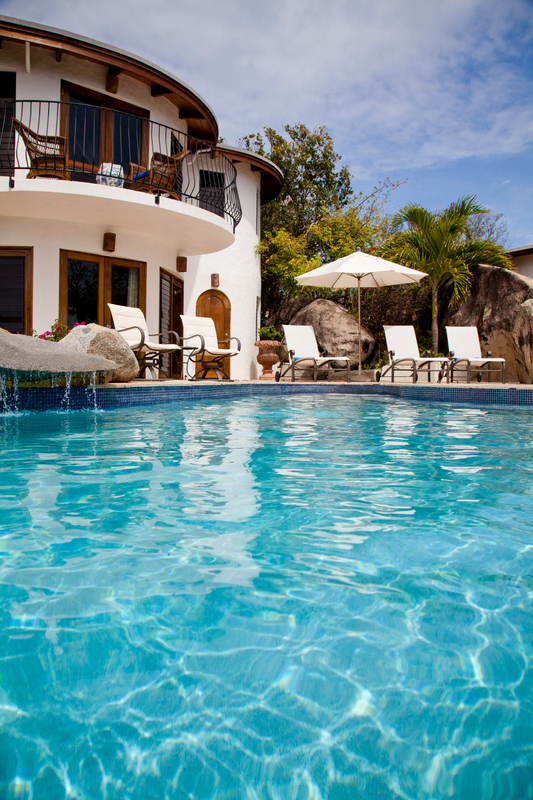 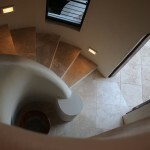 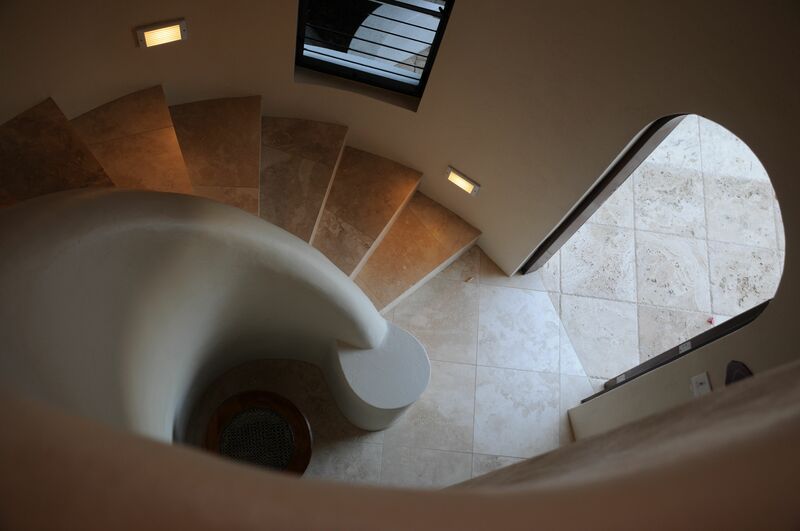 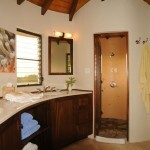 This villa was completely remodeled and expanded in 2008. 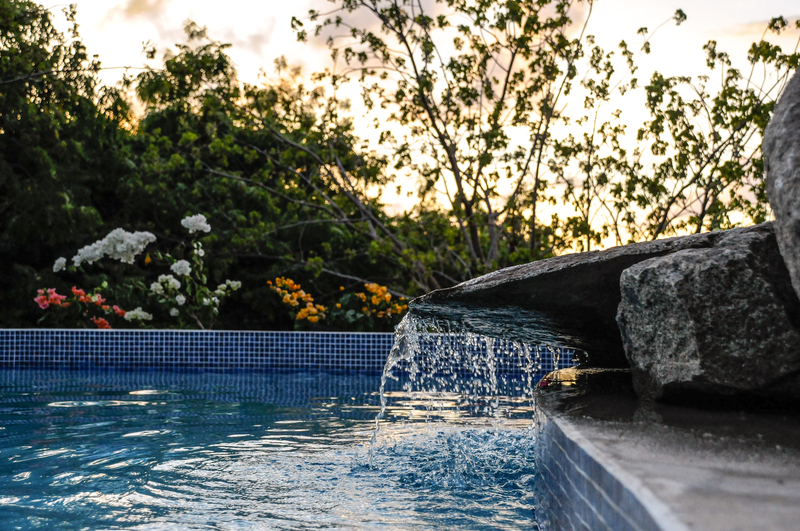 On the Rocks has been designed using only the finest materials in order to create a beautiful and luxurious vacation home. 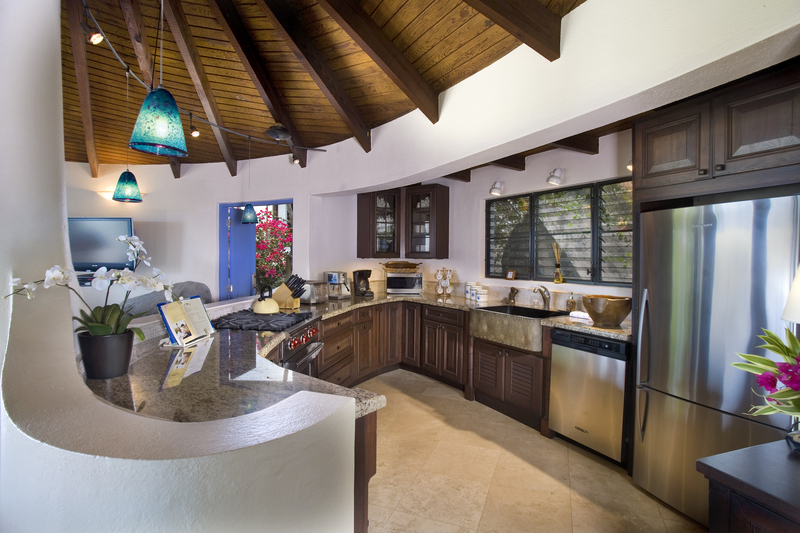 Comfortable furnishings invite you to relax and enjoy your vacation.The all new gourmet kitchen is equipped with a Wolf range, granite counter tops, liptus wood cabinets, stainless steel appliances and halogen task lighting. 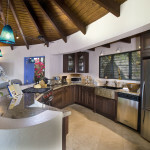 Whether you wish to do the cooking yourself or hire a local Chef, entertaining is easy with this finely equipped cook’s kitchen. 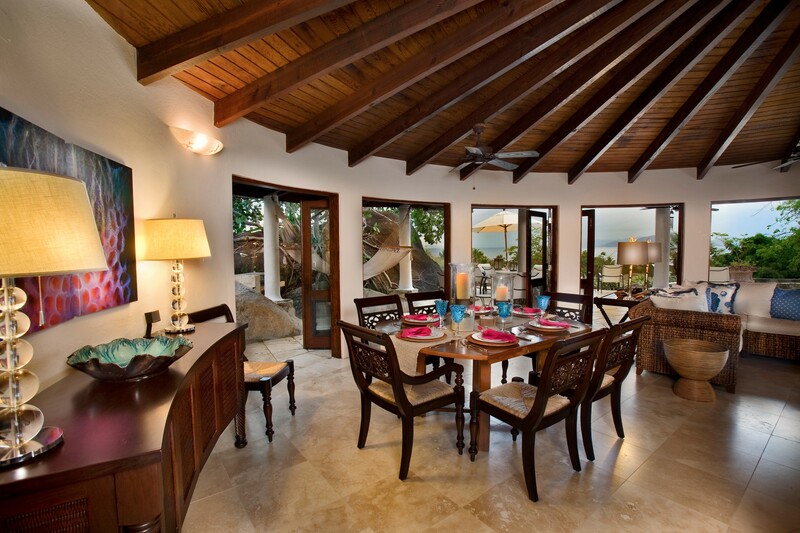 The living room is exquisitely appointed with a richly stained 14′ exposed beam ceiling, sea grass furniture, custom dining room table all accented in Caribbean colors. 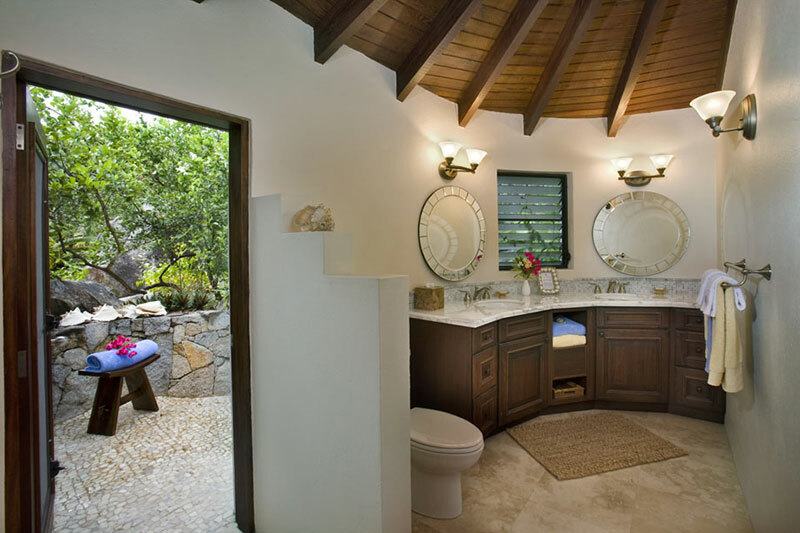 With its unique circular space, this room completely opens up to create an open air living environment which flows freely onto the pool terrace to take advantage of the beautiful views, ocean breezes and spectacular sunsets. 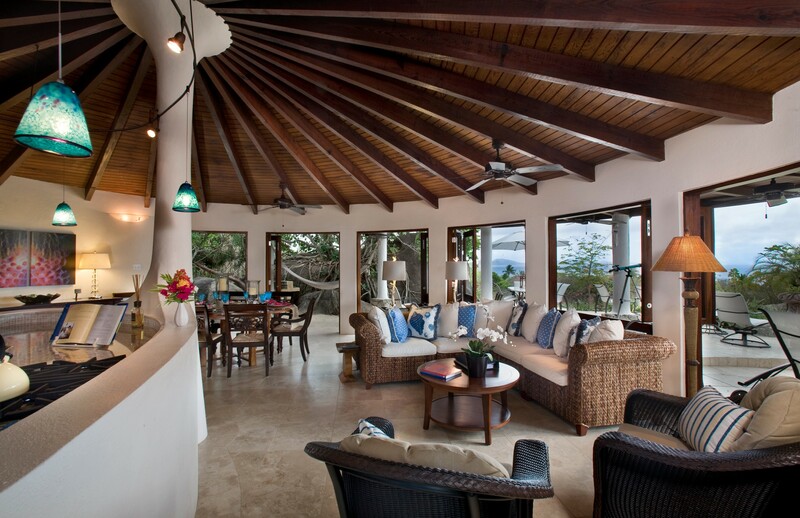 This is a wonderful gathering room to spend time playing games, reading or watching a DVD from our large movie collection or simply relaxing to the sound of the ocean. 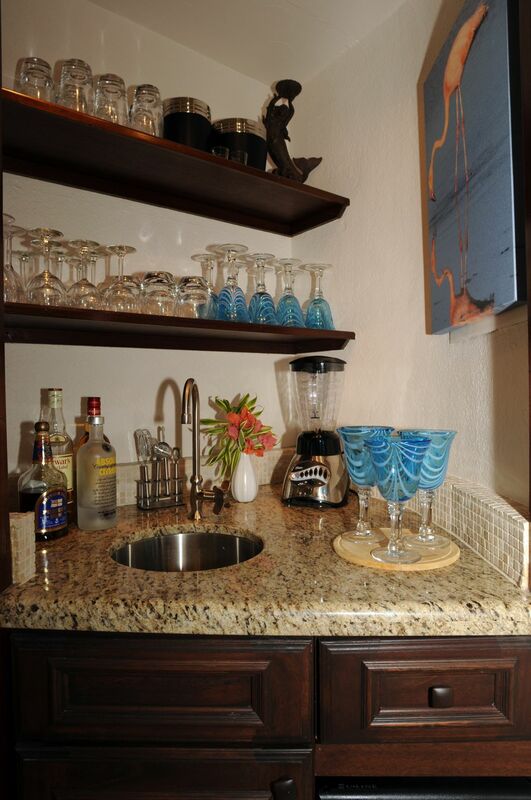 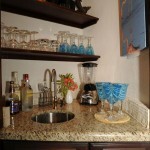 Just off the living room you will find a fully equipped wet bar with built in ice maker. 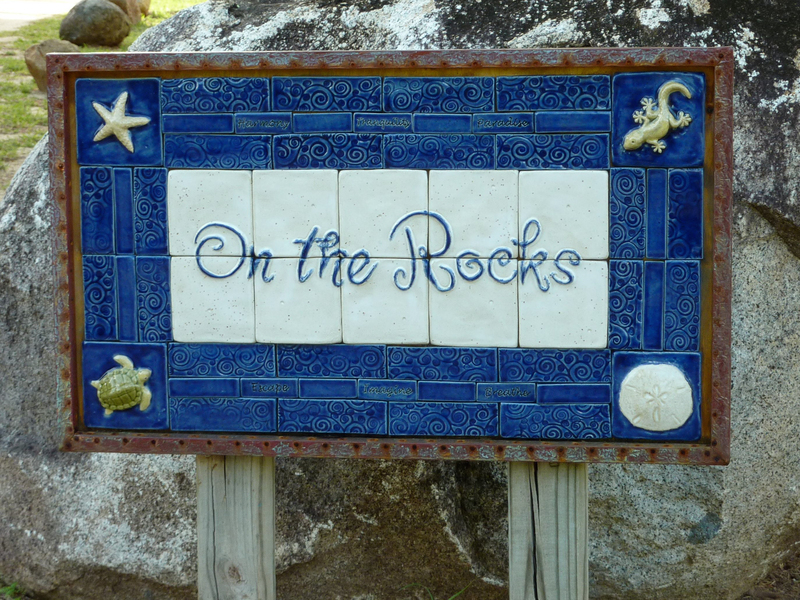 On the Rocks provides indoor and outdoor dining complete with a custom outdoor charcoal grill. 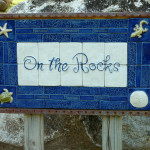 On the Rocks features 4 luxurious bedroom suites, each having a character and style of its own. 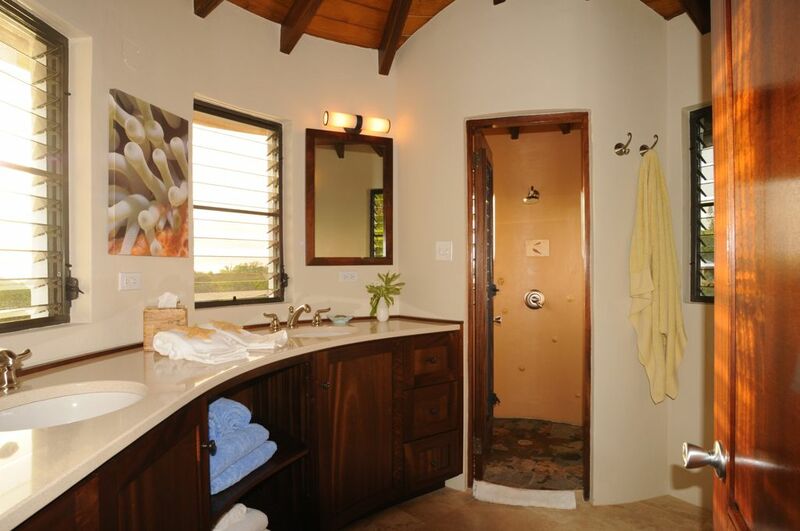 Each private suite has air-conditioning, flat screen TV and DVD Player, outdoor shower, robes, electronic safe, hairdryer, magnifying mirror, fine linens, and plush Euro-Top mattresses. Located in the main house, Rising Sun is a king bed suite with two sets of French doors that open to a private patio tucked in a lush garden setting. 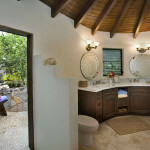 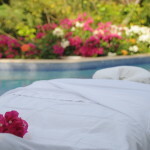 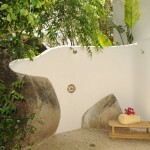 This suite has a large outdoor shower which is surrounded by tropical plants and flowers for maximum privacy. 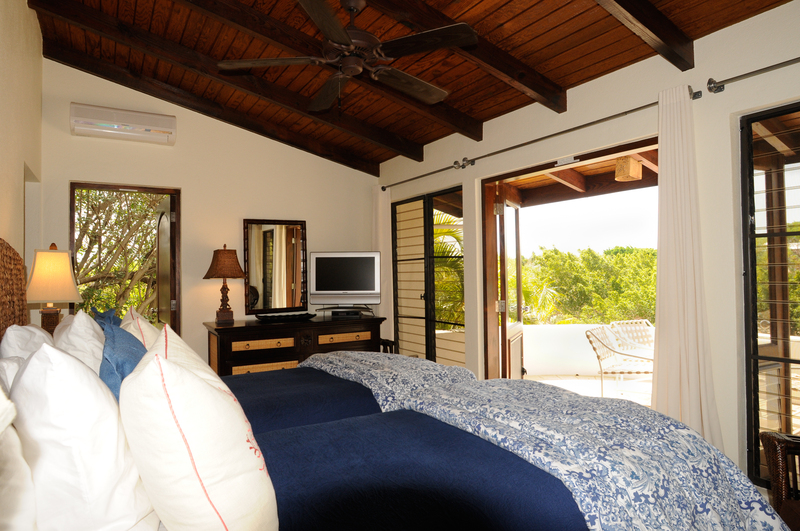 A peaked ceiling with exposed beams add a rustic Caribbean charm to this suite. 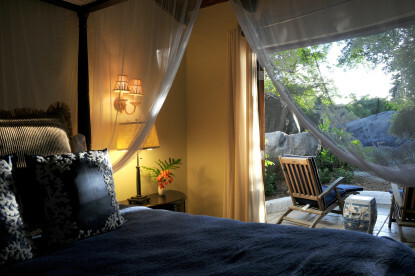 This suite is located in its own building a few steps away from the main house. 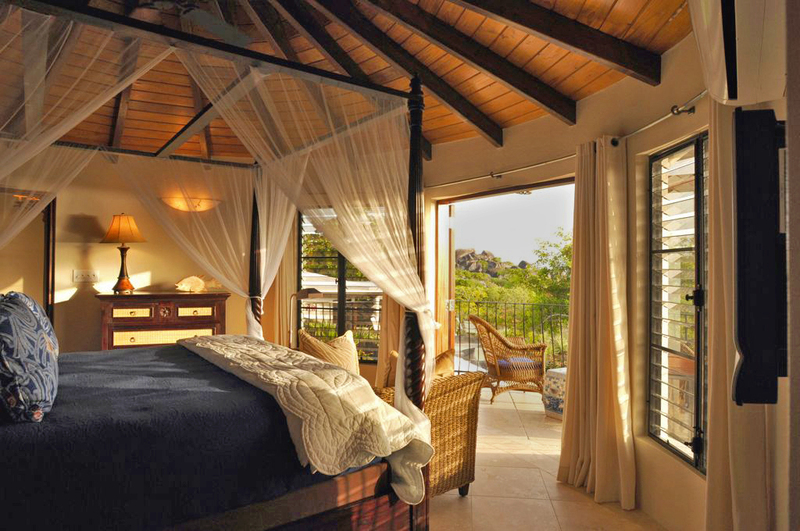 French doors open onto a balcony which views a beautiful lawn , fichus trees and tropical flowers. 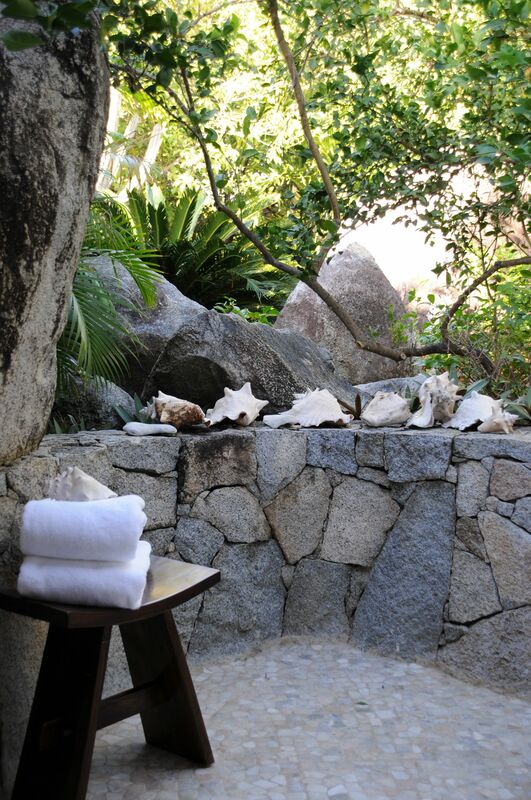 Trade Winds has a large private outdoor shower nestled in the boulders and surrounded by lush vegetation for utmost privacy. 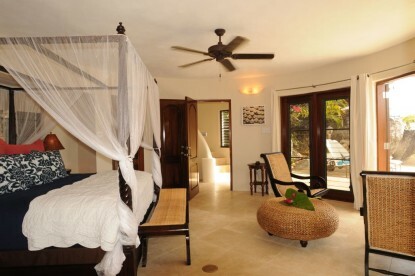 This suite offers twin beds that can be converted to king. Located poolside, Sea Breeze is a circular king bedroom suite with French doors that open onto the spacious pool deck. 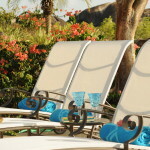 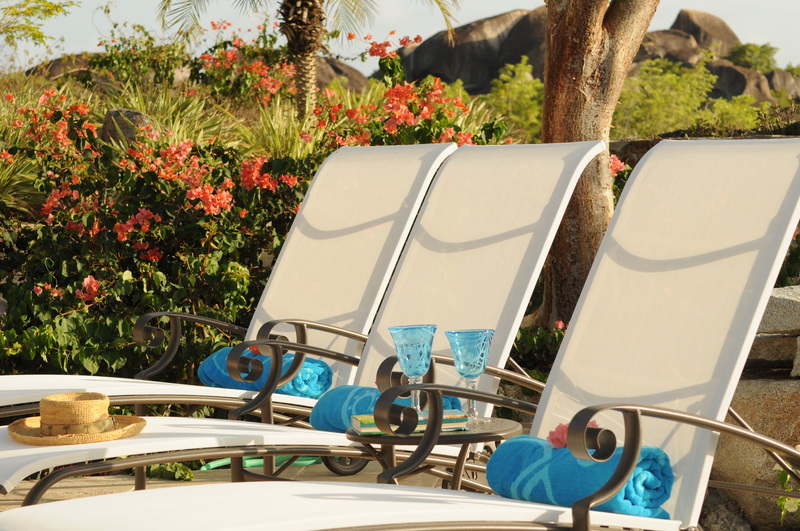 The comforts of this suite provide additional seating for relaxing and enjoying the easy access to the pool. 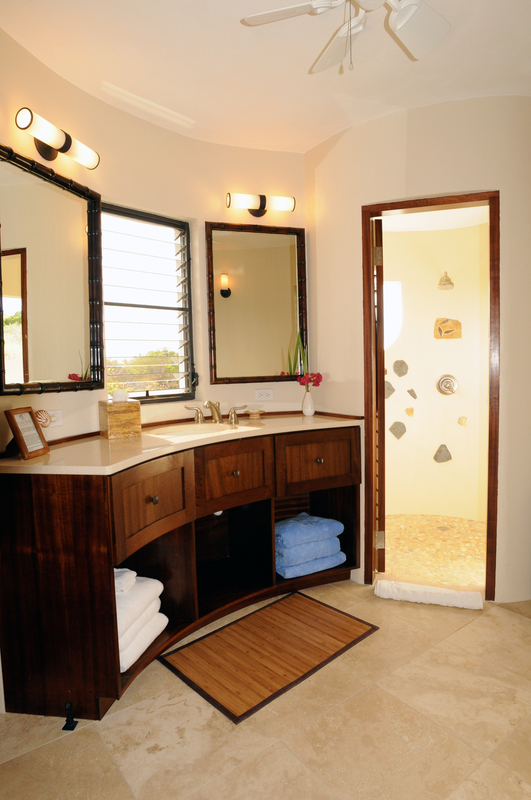 An open air shower offers spectacular views and sea breezes. This king bed suite is located high above the pool deck accessed by its own private circular staircase. 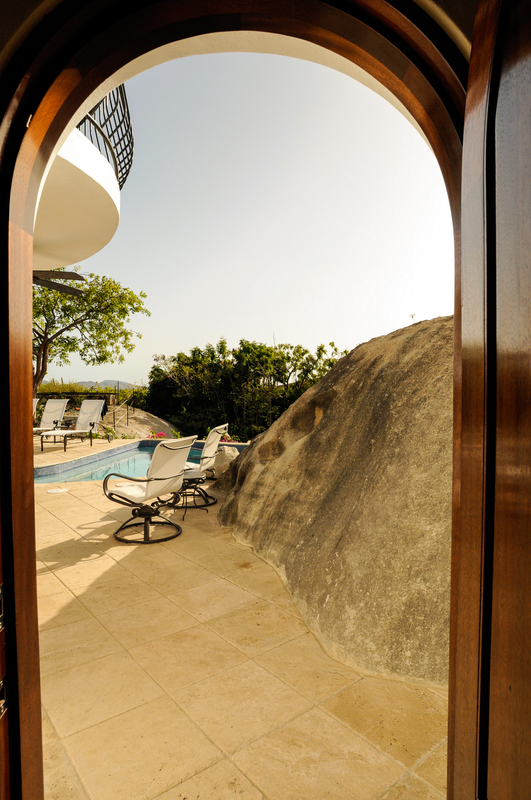 French doors open onto a balcony overlooking the pool and beyond to the sea. 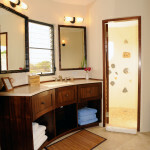 High Tide has an open air shower with beautiful panoramic views. 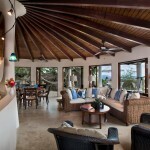 A peaked ceiling with exposed beams adds a dramatic charm to this suite. 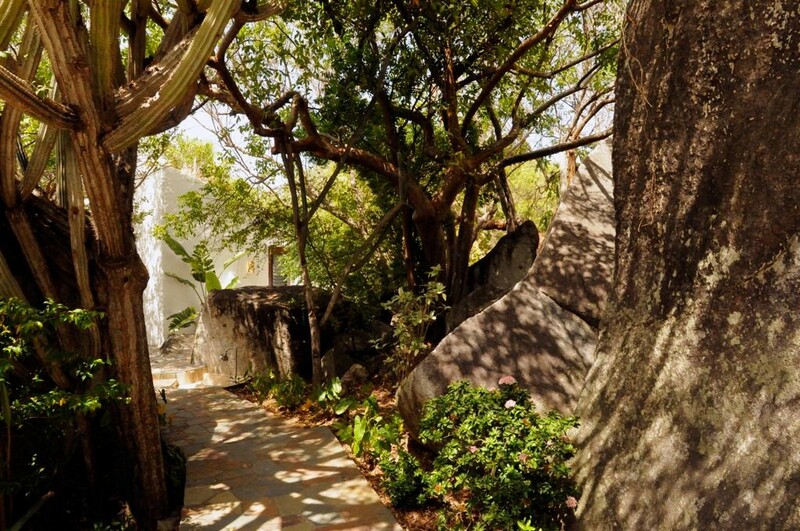 As you meander up the gently rising entry stairs to On the Rocks you will be in awe of the giant boulders that surround you. 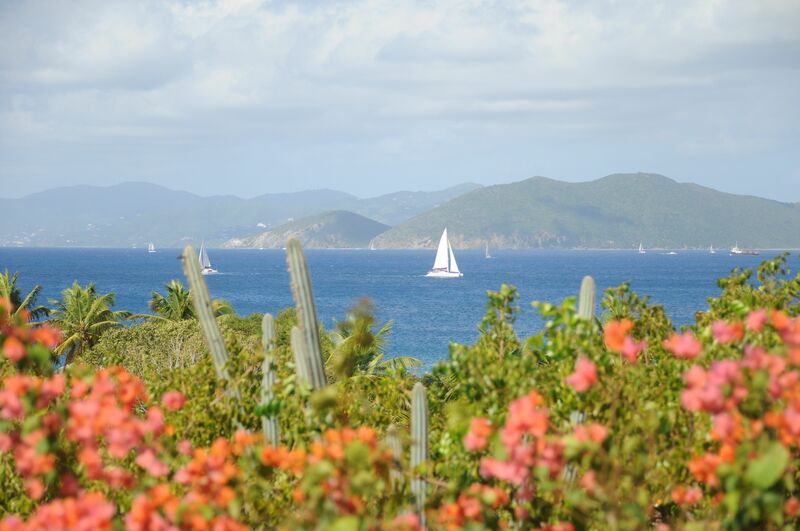 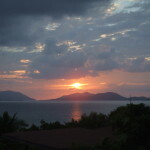 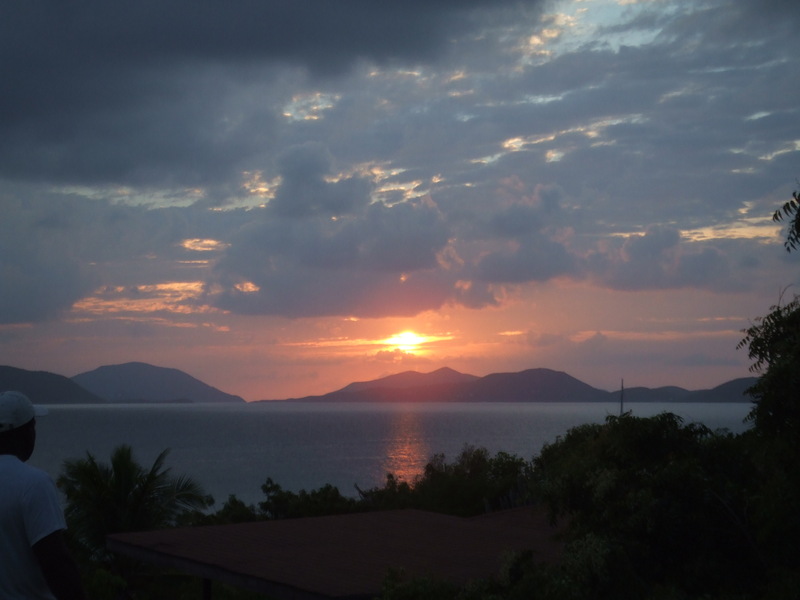 Once you reach the top, the view of the Sir Francis Drake channel and the other islands is breathtaking. 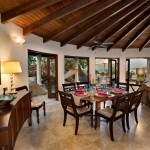 The delightful breezes and changing sea views invite you to relax. 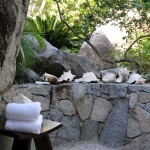 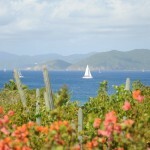 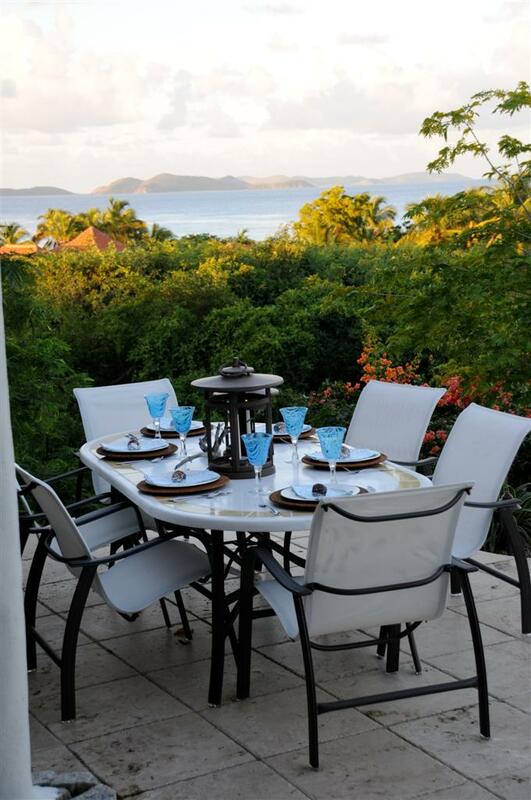 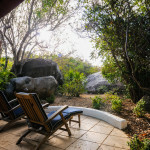 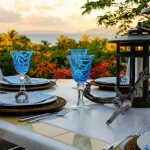 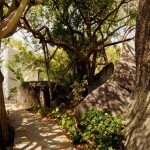 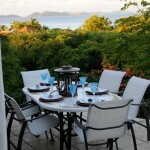 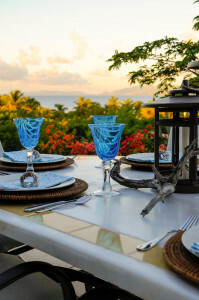 On the rocks is nestled in the geographical wonders of the famous granite boulders of Virgin Gorda. 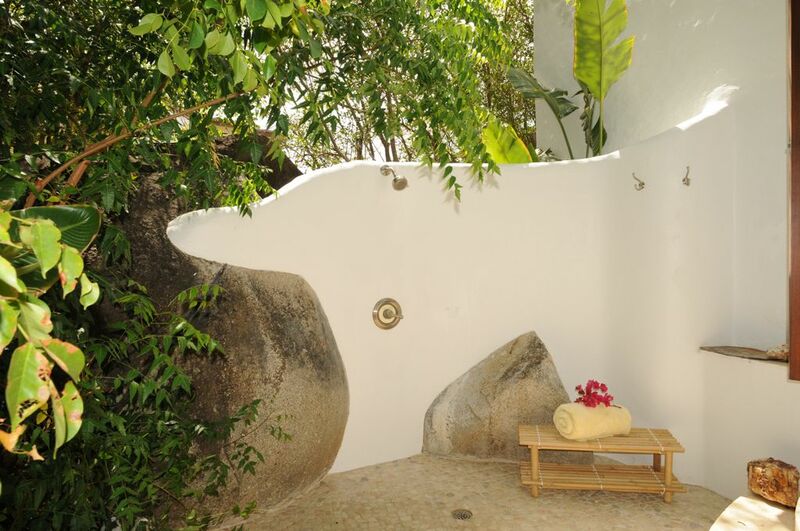 It is located on the most desirable part of the island and within walking distance to the world famous destination “The Baths”. 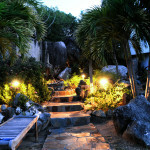 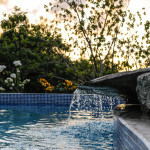 On the Rocks has a fresh water pool with a unique water feature and beautiful fiber optic lighting. 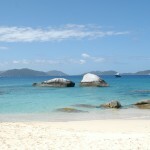 The secluded beach of Little Trunk Bay is 100 yards from On the Rocks. 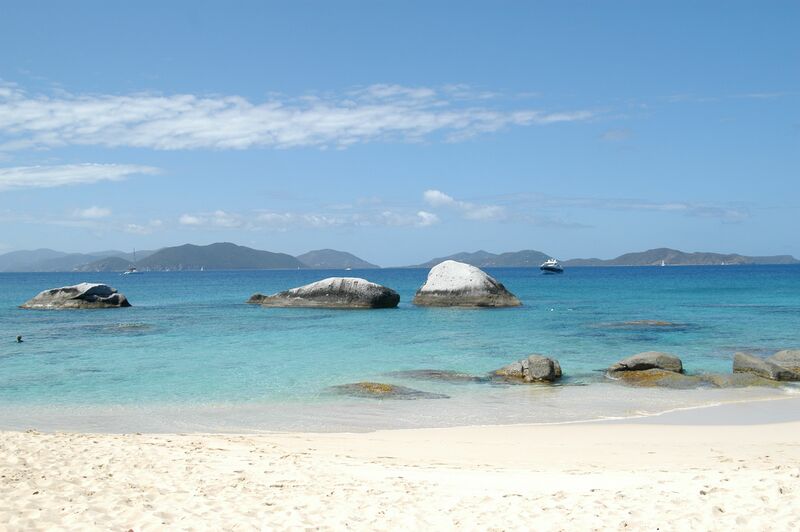 This pristine beach offers sugar white sand, crystalline waters, boulder and coral reef snorkeling, and the opportunity to read that much anticipated novel. 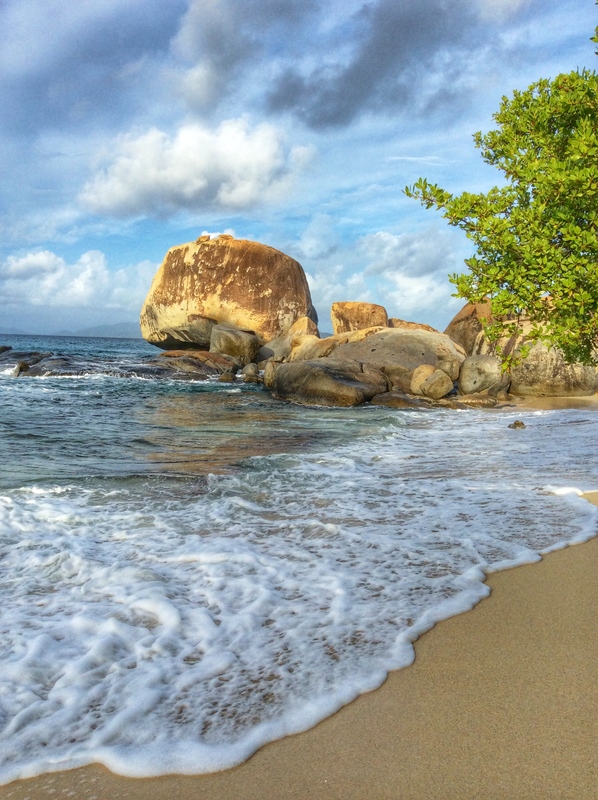 Explore the other neighboring beaches, Valley Trunk, long stretches of perfect sand with boulders and palm trees that adorn the sand, or explore ” The Crawl” 50 ft to the south. 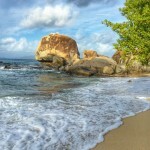 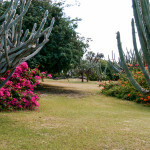 This is a smaller beach with a barbeque area and a local steel band that plays on Thursdays. 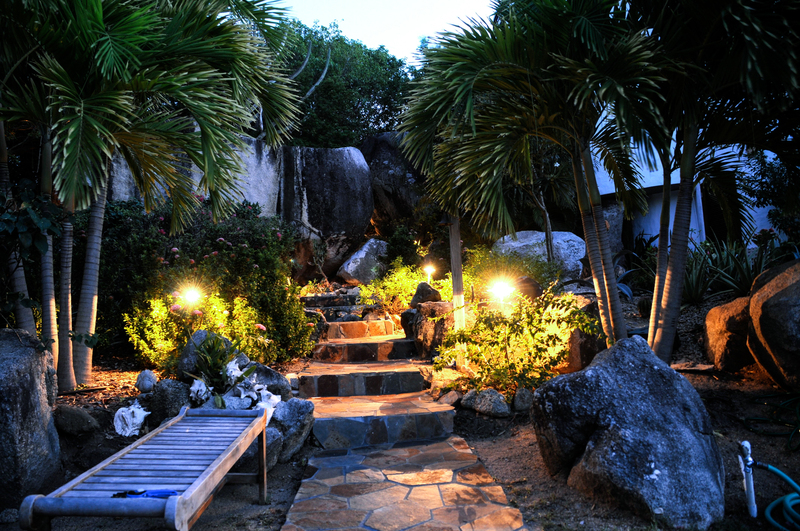 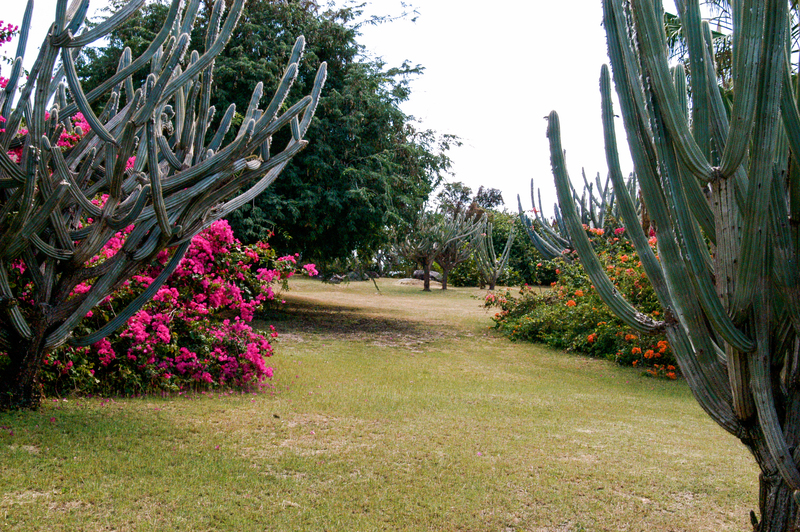 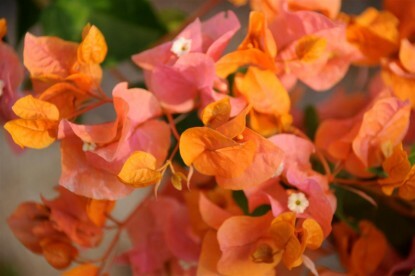 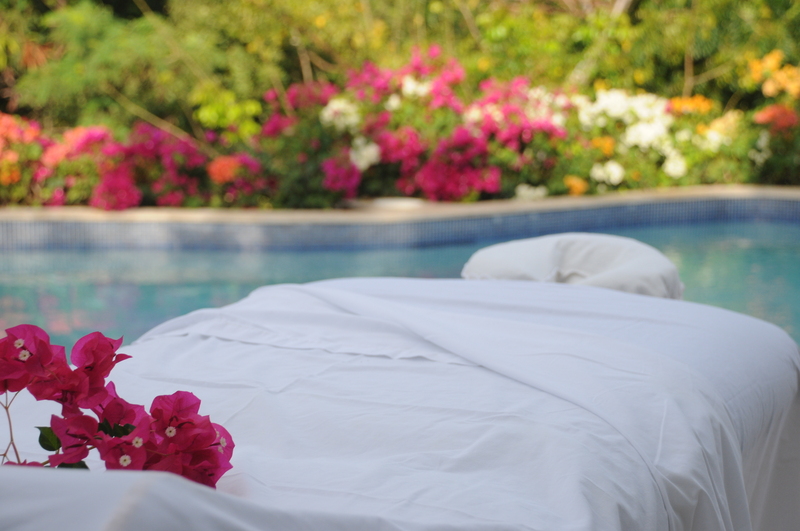 On the Rocks is surrounded by jasmine, orchids, palm trees, hibiscus, and many more tropical treasures. 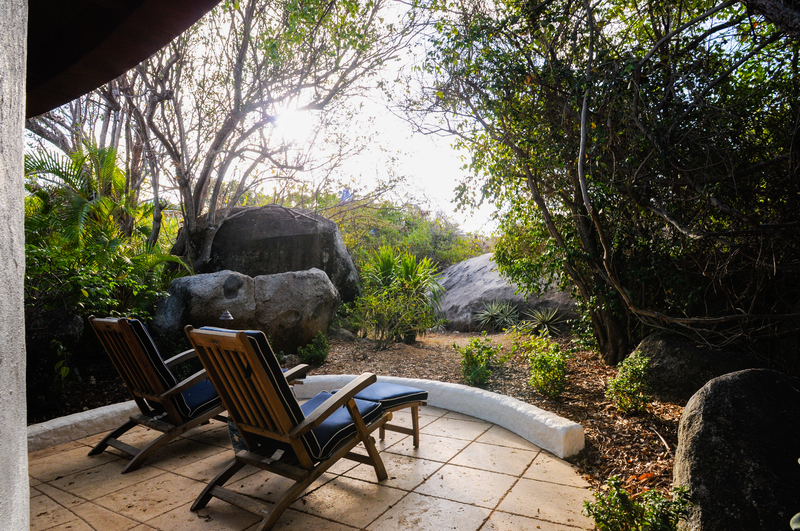 Staying at On the Rocks will feel like you are in your own private sanctuary.